Christina Dodd blew me away with this amazing romantic suspense! Dead Girl Running is set up as the perfect thriller for readers who love a competent heroine with a past shrouded in danger and deceit. Kellen Adams is the new assistant manager of the Yearning Sands resort. Kellen is left to hold down the fort on her first day on the job, a task for which she's somewhat confident in her ability to handle, since it's the off-season and there aren't many guests. A skeleton found on the property leads her into a dangerous investigation with an undercover guest. Murder and mayhem abound as Kellen struggles to remember a year of her life and single out a murderer among the people she considers friends and colleagues. She made it through an abusive relationship, and made rank as Captain in the army using a special skillset she acquired after a near fatal head injury, so a murder investigation isn't going to scare her off. 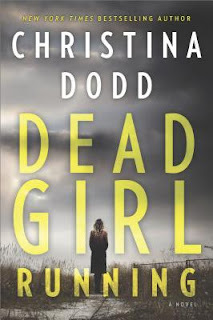 Dead Girl Running is set on an expansive landscape that provides you with images of gray skies and roiling waves of the Pacific, and Christina Dodd makes it work for the story. It enhances the thrill of the chase and Kellen's angst over the past catching up to her, and the present holding deceit and betrayal. It's so easy to get wrapped up in this story looking through Kellen's eyes because she has a unique way of engaging with people. And after everything she's been through, she still has a sense of humor and desire to protect the place that's beginning to feel like home to her. The ending was seriously killer! To convey how much I love this story without adding spoilers is so incredibly hard, but if you enjoyed The Lucky Ones by Tiffany Reisz or Such Dark Things by Courtney Evan Tate, you will not be disappointed! Stay tuned for book 2, WHAT DOESN'T KILL ME, coming early 2019!